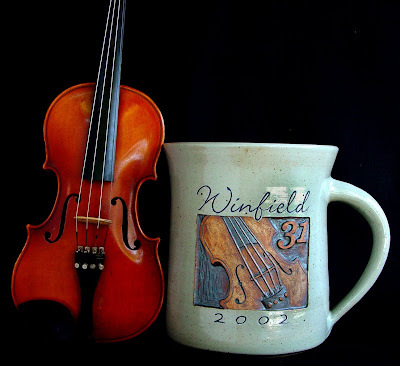 The 02 mug used Zach's fiddle for the design. The fourth edition in 03 was taken from a photo of Cindy playing her banjo. My own hands and dulcimer were the subject for the 05 mug. For some reason, we didn't get a poster made that year. Here's one from the archives! 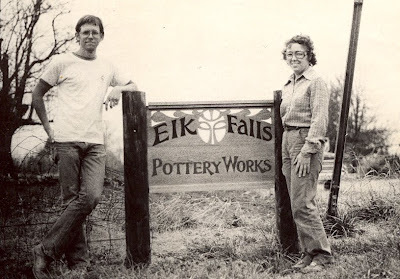 This was taken in 1980 when we first built our shop. 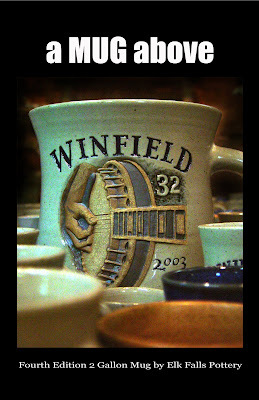 Buried in Winfield mugs. Don't know the exact year, but it was sometime in the 80's. I know I have an older picture somewhere, maybe from the late 70's, but this is our Winfield booth in about 1991. Steve is holding Zach, Cherry is in front and Jane's sister Peggy is behind. For many years, our summer schedule has been dominated by Winfield mugs. It's a daily ritual. Get out to the shop early and throw the first dozen mugs before breakfast. After my usual bowl of Jane's granola (unless we serve breakfast at the Sherman House) it's back out to the shop for the second dozen. Then it's time to start on handles, which take a good part of the rest of the day. That evening I make the third dozen which are held over for handling the next day. In the meantime, Jane is watching the mugs as they begin to dry. She stamps the logos on each one when they are “just right,” not too wet, but not too dry. Then she trims the bottoms, placing them upside down on boards covered with plastic until I attach the handles. Depending on how many interruptions, emergencies, and other demands come up, finishing 36 mugs – thrown, stamped, trimmed, handled and ready to dry - sometimes takes us till midnight. Some days we just don't make quota. 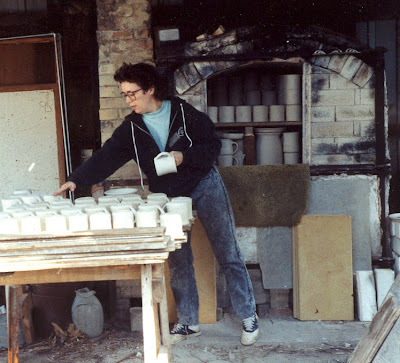 And I haven't mentioned all the incidental tasks like mixing, drying and pugging clay, loading and unloading kilns, firing, glazing, staining, erasing, gardening, mowing, fixing things that break, etc – you know the routine. It's kind of a dance (maybe more like a juggling act). We once figured out that we handle each mug a minimum of 21 times for various steps in the process. We are a good team and we manage to turn out over 1000 mugs for the Walnut Valley Festival in Winfield, KS each summer. 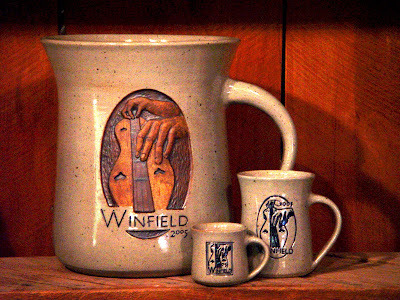 Many people know us only by the Winfield mugs they collect each September. And we certainly never set out to capture that market. How did it happen? Allow me to share a bit of history. When Jane and I returned to Kansas in 1976, a good friend, Sherry, told us about this “bluegrass” festival in Winfield and told us we should go. Now I didn't know much about bluegrass. I was more into Simon and Garfunkle, Crosby, Stills, Nash and Young, and the Beatles. But I did kinda like the Nitty Gritty Dirt Band and I think John Hartford was in the line-up that year. I had at least heard of him! But Doc Watson and Norman Blake? – no clue. Now we had been exposed to a little bit of “folk music” while living in Georgia, but we were not prepared for New Grass Revival and Bryon Bowers! One guy with an AUTOHARP – you gotta be kidding! But it was awesome and we were hooked. Not to mention the pickin and jammin throughout the campgrounds around the clock... it was a music happening the likes of which I had never experienced. Picker's Paradise, they call it. 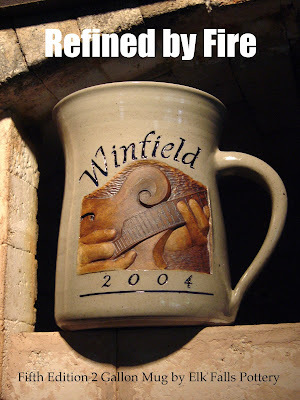 By 1981, we thought it would be neat to make some “special” commemorative mugs for the 10th anniversary of the festival – numbered and dated, with the simple designation of “Winfield.” Being the entrepreneurial risk taker that I am, we boldly made 15 mugs to see if anyone would want one. They sold so fast, we saved the last one and took orders for 86 mugs in all! After filling the orders and shipping them all across the country (really! ), we decided to start a limited edition, signed, dated and numbered and when they sold, there would be no more made. (The only exception is that we will replace broken mugs for someone's collection if they send us the broken pieces. It will not be numbered like the original, but it will as much like the original as possible.) That next year we made 100 mugs and the rest, as they say, is history. The editions gradually grew till we were making 1000 mugs, which we decided was our limit! People stared collecting them and since there was a limited number of them each year, they learned to get theirs early. 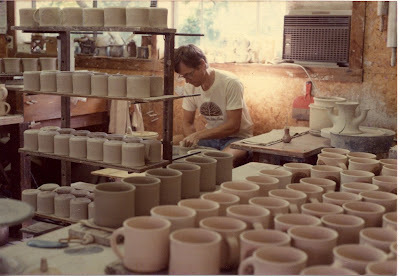 In 1983, Bob Redford, one of the festival founders contacted us about making mugs for them. When I explained what we were already doing, he asked about making another series, different from the Winfield mugs. The Walnut Valley mug series was born with an official festival design. We agreed on a commission price I would pay in exchange for being allowed exclusive rights to produce the “official” festival mug. 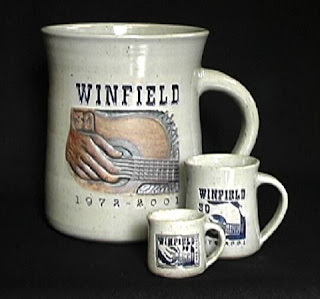 To distinguish the WV series, they were shorter (several years they were more like soup mugs) and we glazed them in a variety of colors opposed to the characteristic gray and blue, taller Winfield series. 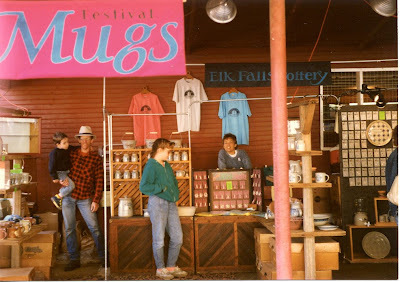 The Walnut Valley mugs had designs to coordinate with other artwork used in the festival, from posters, t-shirts, belt buckles or other designs. Some years I designed both, but the WV design was always subject to approval by the festival. Several years, my designs were also used on the buckles and even on a stage backdrop. The Winfield design would continue to be my choice. At first I went through all the different instruments that had national contests – guitar, fiddle, banjo, mandolin, mountain dulcimer, autoharp, hammered dulcimer. 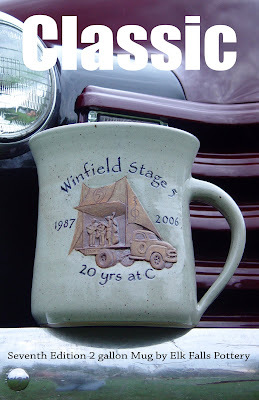 Then came a variety of images representing different elements of the Winfield experience, including cloggers, stand-up bass player, the campgrounds, and the W2K turn-of-the-millennium design. 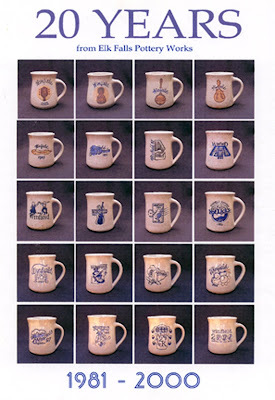 The Winfield mugs necessitated a new technique for reproducing intricate designs which at the beginning was done all by hand using various combinations of paper stencils, stippled stains and sgraffitto. Very time consuming. Eventually, we discovered a stamp company in Wichita which could produce a deep relief flexible plastic die from our artwork. This revolutionized our ability to do custom logos on mugs which oddly enough became a mainstay of our business to this day. We've done hundreds if not thousands of different designs for people over the years. Festivals, businesses, churches, bed and breakfasts, schools, reunions, museums, fund raisers, and events of all kinds. Mugs are us! After 2000, I started using the computer to a larger degree in the designs – using actual photographs of instruments that had some connection to either a family member (son-in-law's guitar, son's fiddle, sister-in-law's banjo, my dulcimer, mom's autoharp) or friend (Mackie Redd's mandolin, Russell Cook's hammered dulcimer.) This year's design is the first departure from that tradition, although it was inspired by a Winfield camper. After 58 different designs, new ideas become more difficult to develop! Who knew? Eventually, the crowd of mug collectors waiting for the new mug became an uncontrollable mob pressing in on us as we tried to set up, unpack, and begin selling with limited help. In 1999, things got out of hand and mugs started “walking off,” at least that's when we actually had proof of it. There was just no way we could watch them all. Not that the majority of our customers weren't honest, but there are always a few bad apples on the tree. So rather than letting those few ruin it for everyone or making us suspicious of everyone, we started the Mug Buffet in 2000. Festival security personnel started organizing the “muggers” even before we arrived, having everyone peacefully and patiently wait in a line down the midway and taping off our booth area giving us room to set up our “buffet line” of just mugs – the Winfield, Walnut Valley, popular Baby Winfields, and sometimes “leftovers” from other festivals or years, as well as some special items. Soup mugs, travel mugs, shaving mugs, one gallon mugs and assorted mug-cessories. Serving begins at noon on Thursday when we cut the tape and start the mug rush. Everyone files by the line, makes their choices, stops at the cashier, and gets their purchases wrapped and sacked – neat and orderly. Everyone gets their mugs, everyone pays, and no one gets hurt! It's become a fun tradition. Get mugged at the Mug Buffet! Well, this has been one long post, but I've enjoyed the trip through the past and believe it or not, I left some things out! Maybe I'll add them later. Right now it's time to hit the hay so I can get up and start again. Tomorrow is baby Winfields, but it'll be a non-quota day cause it's Saturday and we are going out in the evening for my birthday! !